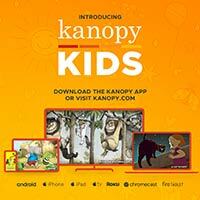 Kanopy Kids: Streaming Video for Pre-K and Up! The popular on-demand video streaming service, Kanopy, now includes Kanopy Kids: thoughtful entertainment for children aged preschool and up. Parents and caregivers can stream videos from a curated selection of educational and enriching videos on Kanopy Kids with developmentally appropriate, age-based ratings from Common Sense Media, as well as additional parental controls to help keep kids safe. Kids' categories include TV Series, Learning Languages, Animated Storybooks, Anime Favorites, Classic Films and Movies for the Whole Family. Key titles include Arthur, Babar, Franklin & Friends, Maya the Bee, Wild Kratts, Between the Lions, and Little Pim. The collection also highlights classic films from Charlie Chaplin & Buster Keaton and Oscar® nominated titles, including A Cat in Paris and The Secret of Kells, plus family-friendly documentaries, Girls Rock and The Endless Summer. Access Kanopy Kids at https://crrl.kanopy.com/kids, or enter through the main Kanopy site, and click on "Kids" in the upper right corner. Click again to toggle out of Kids Mode and return to the main Kanopy collection. Library customers have 10 credits per barcode each month to use between Kanopy and Kanopy Kids. Kanopy Kids offers 500 selections to start and will be adding approximately 100 more each month. Parents can set a four-digit pin to prevent kids from viewing a title that has not been approved for viewing in Kanopy Kids. While in Kids Mode, Watchlists and Viewing Histories will automatically be filtered to show only age-appropriate content when in Kids Mode. Access Kanopy Kids on your computer, television, or mobile device with apps available for iOS, Android, Roku, Apple TV, Chromecast, and Amazon Fire Tablet. Read more about Kanopy's streaming video service here.